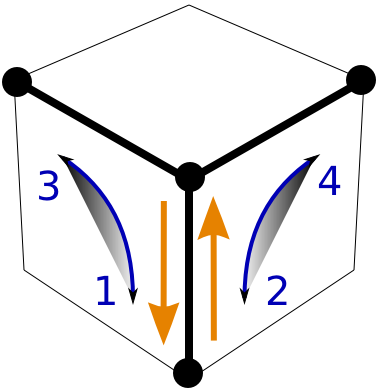 Solve three of the four edges in the middle layer. We don't solve the edge above the unsolved corner. After step 3 we have solved the bottom and the middle layer except for two cubies in a vertical column. Use the Y-move to cycle edge cubies from the top layer into the middle layer. 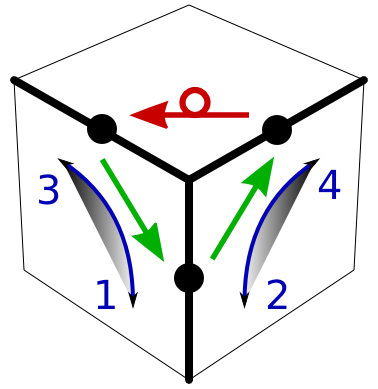 In preparation of the Y-move, turn D to move the remaining free bottom corner into the corner position that is affected by the Y-move. Undo the D-move when done. The edge cubie is in the top layer. We prepare with Di so that the Y-moves only involve the free bottom cubie, and we restore the bottom with D. Pick Y or Yi so that the first quarter move 'does the right thing'. The edge cubie is in the middle layer. Use D Y Di to move the edge cubie to the top layer. It doesn't really matter whether we use Y or Yi here, but one of them may give a shorter continuation. The basic Y-move is just what we need - but don't forget to prepare/reset the bottom layer. Y along up-right minus last.